Home births with a midwife are becoming increasingly popular. Such home births occur outside hospital, most often at home. 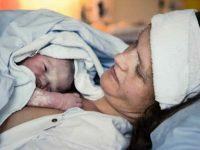 Homebirth is usually held by a specially trained midwife (less frequently by an obstetrician-gynecologist), but sometimes women deliver without any medical assistance. Home birth in water is also practiced. In many European countries, homebirth is widely spread: up to 40% of all births occur at home. Home birth with midwife is a good alternative to a maternity hospital. Homebirth can be recommended to only healthy women with uncomplicated pregnancy. If the doctor suggests the possibility of complications during childbirth, the woman must deliver a baby in hospital. Homebirth is usually supervised by a midwife who works at a nursing home, while ambulance is on duty near the dwelling of the future mother. If a woman encounters any problems during childbirth, the midwife can provide first aid. If any serious problems — the ambulance will deliver the woman or child to the nearest maternity hospital. For birth, the midwife must have all the necessary preparations and tools. The ambulance is equipped with everything necessary for emergency care. On the way to hospital, the midwife reports about a patient with complicated childbirth. How to chose a midwife for home birth? Home midwife training lasts at least 6 years. Home midwife must be reliable, stress-resistant, sympathetic. First, check the documents on medical education, read reviews on the Internet, and ask those, who have given birth with the help of this midwife. If the midwife doesn’t ask you about any diseases, possible contraindications to give birth at home, about your previous pregnancies and deliveries (if any), you should put her professional qualities in doubt. The midwife should tell you about delivering at home in detail, to prepare you for childbirth, to teach you right behavior during labor. Ask her about what she’s going to do, if complications arise during childbirth. Introduce a midwife to the family members, who plan to be present at birth. They should also be told about the course of labor, about their role in the home childbirth. Before delivery, you must attend at least 10 sessions in the courses of preparation for childbirth, preferably together with your husband. If the midwife speaks only about the price and about how «wonderful» your future delivery will be, refuse her services. extensive experience in helping to deliver babies. Best home midwives, seriously engaged in their work, will never agree to assist an unknown woman with delivery. At first, the expectant mother needs to visit special training courses, and consult the midwife, and provide her with all the necessary information and test results. Only after that, she will assist you in labor. protests of the husband and his unwillingness to help. Do not plan to give birth at home, if at least one of the listed items. In such a situation, any experienced and conscientious midwife will persuade you to go to hospital. In conclusion, I would like to remind, that homebirth is suitable only for healthy women with uncomplicated pregnancy. The decision to give birth at home with a midwife should be deliberate. You can decide on the place and the mode of delivery only with a practicing obstetrician-gynecologist. Remember, that for midwives your home birth is also a way to make money, so be wise while choosing! Hope, you will make the right choice.